β- cryptoxanthin Do you have enough? Starting from December 2015, the BANANA Leaf Cafe of PAPUA mart Group right now sell the Red Pandanus Oil from Jakarta. We hope that the Papua Red Pandanus Oil will contribute to the healing of many human beings in the world who are suffering various modern deadly diseases cased by either our modern unhealthy lifestyle or by our polluted environment. 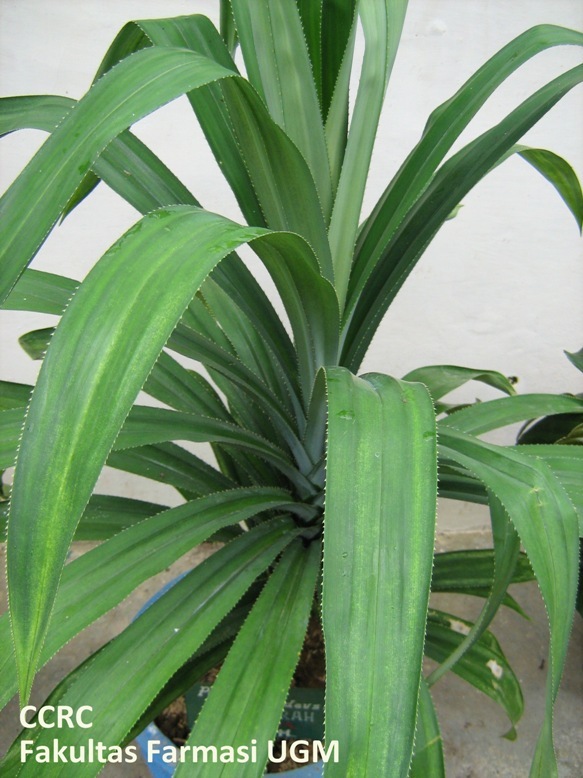 Species : Pandanus conoideus Lam. Red fruit cultivars distinguished based on the size of the fruit, fruit color and fruit shape. Cultivars are known among other is a short red cultivars, red-brown, red being, long red, long yellow, and yellow short (Sadsoeitoeboen 2003;Limbongan dan Uhi 2005). Generally, up to 10-year-old plants, fruiting at the age of 3-5 years, and the age of 3-4 months until harvest fruit. Plants grow clumped with a density of 12-30 individuals per clump. Red fruit plants have roots tunjang 0.20 to 3.50 m, root circumference 6-20 cm, brown with white spots, spherical shape, and surface spiny. The number of roots in a clump ranged between 11-97. The main trunk circumference ranged between 20-40 cm, plant height from 2 to 3.50 m. The stem is brown with white spots, round, beam vessels does not seem obvious, hard, direction grow vertically or upright, branching number 2-4, and prickly surface. Leaves measuring 96 cm x 9.30 cm to 323 cm x 15 cm. The tip of spear-shaped leaves (micronate), perforated base (cut off), bottom edge of the leaf and the leaf barbed bone. Single leaf composition with alternate leaf arrangement. Leaves pliable, dark green, parallel vein patterns, no petiole (sessile), and not flavorful. Flowers like jackfruit flowers with reddish color. Fruit length measuring 68-110 cm, diameter 10-15 cm, cylindrical, blunt tip, and a base such as heart. While still young, pale red fruit, and turned into a red brick while old. There are three types of red fruit superior, that are red fruit Mbarugum, Maler, and Magari. Several criteria superior red fruit that are: 1) number of fruit 5-10 grains / clump, 2) soft pith, 3) large fruit size (diameter 10-15 cm) and large (60-110 cm), 4) results essence (oil) high, average 120 ml/kg piece, 5) number of tillers many, that is 5-10 tillers / clump, and 6) a lot of number of roots tunjang, that is 11-97 roots / clumps, thus able to supply more nutrients, absorb oxygen from the air, and strengthen the plants stand upright(Lebang dkk., 2004). Red piece plants were found in Papua, Papua Nugini. and began sporadically planted in some areas such as Maluku, Sulawesi, Kalimantan, Jawa, and Sumatera. These plants can be grown on the plains to a height of 2,500 m above sea level, with low soil fertility, acid to moderately acid (pH 4,30- 5,30), with shade 0-15%, and grow in clusters around the flow of the river (Nainggolan, 2001; Hadad dkk., 2005). Red fruit is used by the public as a food flavoring of high nutritional value because it contains beta-carotene, natural colorant that do not contain heavy metal and harmful microorganisms. Besides that, red fruit functioned as a supporting daily staple food, and cure various diseases that are cancer, HIV, malaria, cholesterol, diabetes mellitus, gout and osteoporosis. Dregs of red piece can also be used as poultry feed while the roots can be made rope, binding and mats then the trunk as the board (Moeljopawiro dkk., 2007a; Limbongan dan Malik, 2009). Research in in vivo through histological observations through histological observations dimetilbenz(a)antrasen (DMBA) shows that red fruit juice has the ability inhibit the growth of cancer at doses 0,21 mL/ 200 g BB whereas at higher doses an increase in tumor growth. This is probably due by high levels of β-carotene in red fruit juice, thus increasing the damage of tissue and tumor growth in lung. Based on the research that has been done regarding the effect of β-carotene on the growth of lung tumors tested on ferrets, stated that giving β-carotene in high doses (2,4 mg/kgBB per day) for six months can cause development of alveolar cell proliferation and metaplasia keratinization squamous (Wolf, 2002; Munim dkk., 2006). The content of red fruit juice that has anticancer activity is β -cryptoxanthin which is a provitamin A. Kinds of other carotenoids such as a-carotene and β-carotene did not affect the growth of cancer cells even β-carotene at high doses increase the mortality of lung cancer patients in the USA when compared with patients with lung cancer who did not receive β-carotene and vitamin A synthetic (Waspodo dan Nishigaki, 2007). Testing of red fruit oil on A549 cells (lung cancer cell) shows that at concentrations greater than 500 mg/ mL occurs A549 cell growth inhibition. From 500 mg of the red fruit oil contained 0,015 µg β-cryptoxanthin so that the concentration of β -cryptoxanthin relatively little has been able to inhibit growth of lung cancer cells and this was confirmed with clinical trials against 18.244 men Shanghai who smoke. In testing it was found that increased levels ofβ-cryptoxanthin in blood decreased the incidence of lung cancer while others micronutrient such as a -carotene, β-carotene, Vitamin E had no effect on the incidence of lung cancer in smokers (Waspodo dan Nishigaki, 2007). Research of β-cryptoxanthin of orange peel on liver cancer cells turned out to prove his ability as an anticancer in other types of cancer, other than lung cancer. Based on the mechanism of action of carotenoids as a nutrient in Retinoic Acid Receptors (RARs) it is possible β-cryptoxanthin work through the RARs various factors that affect gene transcription both on the type of lung cancer and other cancers (Waspodo dan Nishigaki, 2007). Fatty acid content reaches 94% of red fruit oil has proved similar to the composition of fatty acids of animals compared to the fatty acid composition of plant. Types of fatty acids are not included in the class of trans fatty acids so the red fruit oil will not cause obesity, atherosclerosis, diabetes mellitus and breast cancer (Waspodo dan Nishigaki, 2007). Hadad, Atekan, M., Malik, A., and Wamaer, D., 2006, Karakteristik dan potensial tanaman buah merah (Pandanus conoideus Lamk.) di Papua, Prosiding Seminar Nasional BPTP Papua, Jayapura 24-25 Juli 2006. Balai Besar Pengkajian dan Pengembangan Teknologi Pertanian, Bogor, hlm. 243-255. Lebang, A., Amiruddin, Limbongan, J., Kore, G.I., Pambunan, S., and Budi. I.M., 2004. Pelepasan Varietas Buah Merah Mbarugum, Laporan Usulan Kerja Sama Balai Pengawasan dan Sertifikasi Benih Tanaman Pangan dan Hortikultura Provinsi Papua dengan Balai Pengkajian Teknologi Pertanian Provinsi Papua. Limbongan, J. and Uhi, H.T., 2005, Penggalian Data Pendukung Domestikasi dan Komersialisasi Jenis, Spesies dan Varietas Tanaman Buah di Provinsi Papua, Prosiding Lokakarya I Domestikasi dan Komersialisasi Tanaman Hortikultura, Jakarta 15 September 2005, Pusat Penelitian dan Pengembangan Hortikultura, Jakarta. hlm. 55-82. Limbongan, J., and Malik, A., 2009, Peluang Pengembangan Buah Merah (Pandanus conoideus Lamk.) di Provinsi Papua, Jurnal Litbang Pertanian, 28(4): 134-136. Moeljopawiro, S., Anggelia, M.R., Ayuningtyas, D., Widaryanti, B., Sari, Y., and Budi, I.M., 2007a, Pengaruh Sari Buah Merah (Pandanus conoideus Lamk.) terhadap Pertumbuhan sel Kanker Payudara dan Sel Kanker Usus Besar, Berkala Ilmiah Biologi, 6(2) : 121-130. Moeljoprawiro, S., Nuringtyas, T.R., Noveriza, R., and Trisilawati, O., 2007b. Kajian Bioaktif Antikanker 3 Varietas Buah Merah: Identifikasi fraksi bioaktif antikanker payudara dan kanker rahim dan mikrobia kontaminan pada 3 varietas buah merah (Pandanus conoideus Lamk. ), Laporan Hasil Penelitian Kerja Sama Universitas Gadjah Mada dengan Badan Litbang Pertanian, hlm. 61. Munim, Andrajati, A.r., and Susilowati, H., 2006, Uji hambatan tumorigenesis sari buah merah (Pandanus conoideusLamk.) terhadap tikus putih betina yang diinduksi 7, 12 dimetilbenz(a)antrasene (DMBA), Majalah Ilmu Kefarmasian, III(3): 153-161. 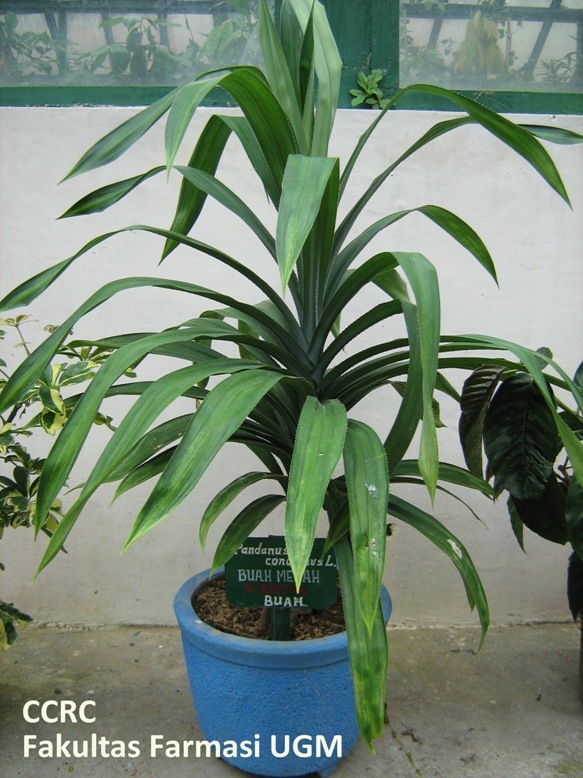 Nainggolan, D., 2001, Aspek Ekologis Kultivar Buah Merah Panjang (Pandanus conoideus Lamk.) di Daerah Dataran Rendah Manokwari, Skripsi, Fakultas Kehutanan, Universitas Negeri Papua, Manokwari. Sadsoeitoeboen, M.J., 2003, Buah merah (Pandanus conoideus Lamk.) dalam Kehidupan Suku Arfak di Kabupaten Manokwari, Prosiding Lokakarya Nasional Pendayagunaan Pangan Spesifik Lokal, Jayapura 2-4 Desember 2003. Kerja Sama Dinas Pertanian Tanaman Pangan dan Hortikultura Kabupaten Jayapura dengan Universitas Negeri Papua. hlm. 155-160. Waspodo, I.S., and Nishigaki, T., 2007, Novel Chemopreventive Herbal Plant Buah Merah (Pandanus conoideus) for Lung Cancers, PATPI Conference Bandung, 17 – 18 Juli 2007. Wolf, G., 2002, The Effect of β -carotene on Lung and Skin Carcinogenesis, Carcinogenesis, 23:1263-1265.